True enough, religion has often been the breeding ground of convictions. But a belief doesn’t have to be particularly religious in content, oriented on god, or rooted in a faith tradition to make the mind its prisoner. Human beings have a weakness for convictions. They make us feel better, at least about ourselves, even if they have the longer-term effect of damaging our soul and foreshortening the human future. Before we dig into the genealogy of conviction, let’s take a couple minutes to identify its salient features. By definition – although this is hardly ever commented upon – a conviction is a belief that holds our mind captive, just like a convict inside a prison cell. There was a time when the belief was a mere proposition, a narrative construct perhaps as simple as a single thought or elaborate as a story, floating like a cloud through our mind-sky. In fact, this is going on for each of us all the time. But then something happens: We believe the thought or story, and with this agreement we invest ourselves emotionally in its truth. At that point (and not before) the narrative construct in our mind engages an internal state of our body and we have an experience. The thought becomes a feeling. This fusion of mind and body, of thought and experience, is the mentallurgy of conviction. A common assumption of our top-down, logocentric, and essentially gnostic Western bias is that thoughts produce feelings. Thinking so makes it so. But what this head-heavy paradigm fails to properly understand and tragically underestimates is the part of us that gives agreement to whatever thoughts or stories are floating through. “To believe” comes from the root meaning “to set one’s heart,” so it makes sense to call this part of us our heart. So we can think something or listen to a story someone else is telling us, but it won’t engage our experience until we set our heart and give agreement to the thought or story. And once fusion is achieved, that thought or story becomes our “truth” – which I have to put in scare quotes to remind us that just believing something doesn’t make it so. In other words, we can give agreement to a narrative construct that has no basis in reality whatsoever; but we are convicted and it no longer matters. Once a conviction is made, our mind closes around the belief. And in time, the belief closes around our mind, becoming the proverbial box we can’t think outside of. Years go by, the world around us changes, and there may even be mounting counter-evidence and good logical reasons why we should let the belief go – but we can’t. Oddly enough, all of these factors can actually be used to justify and strengthen its hold on us. As an early architect of Christian orthodoxy put it, “I believe because it’s absurd.” It’s so unlikely, it just has be true. So, a conviction is a belief – which is our agreement with a thought or story – that has taken the mind hostage and doesn’t permit us to think outside the box. This captivity can be so strong as to prevent our ability to consider or even see alternatives. There is no “other way” for this is the only way. Period. Such are the distinctive features of a conviction. But how does it form? How do we get to the point where we are willing to give our agreement to something that is without empirical evidence, logical consistency, rational coherence, or even practical relevance? 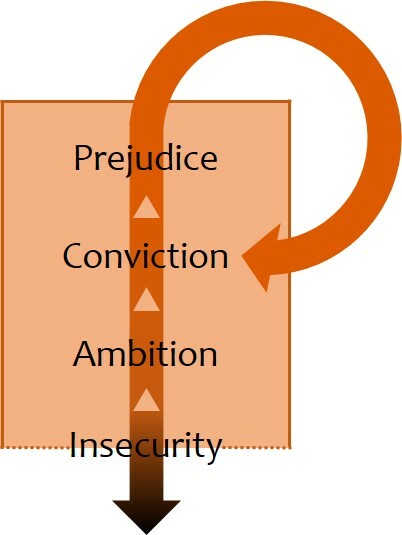 My diagram offers a way of understanding how convictions form in us. Remember, they are not simply true beliefs but beliefs that must be true. What generates this compelling authority around them? Why does a conviction have to be true? The answer is found deeper inside our ego structure and farther back in time, to when our earliest perspective on reality was just taking shape. As newborns and young children, our brain was busy getting oriented and establishing what would soon become the “idle speed” or baseline state of its nervous system. Specifically it was watching out for and reacting to how provident the environment was to our basic needs to live, belong, and be loved. A provident environment made us feel secure, allowing us to relax and be open to our surroundings. An improvident environment stimulated our brain to set its idle speed at a higher RPM – making our nervous system hypersensitive, vigilant, and reactive. This baseline adaptation wasn’t a binary value (either-or, on or off) but rather an analog (more-or-less) setting regarding the basic question of security. I’ve placed the term “insecurity” on the threshold between the external environment and our body’s internal environment because it is both a fact about reality and a feeling registered in our nervous system. As a matter of fact, the reality around us is not perfectly secure. Any number of things could befall us at any moment, including critical failures and dysfunctions inside our own body. For each one of us, the timing of delivery between our urgent needs and the supply of what we needed was not always punctual, reliable, or sufficient; sometimes it didn’t come at all. The early responsibility of our brain, then, was to match the nervous state of our internal environment (how secure we felt) to the physical conditions of our external environment (how secure we actually were). To the degree we felt insecure, we were motivated to manipulate our circumstances in order to find some relief, assurance, and certainty about the way things are. 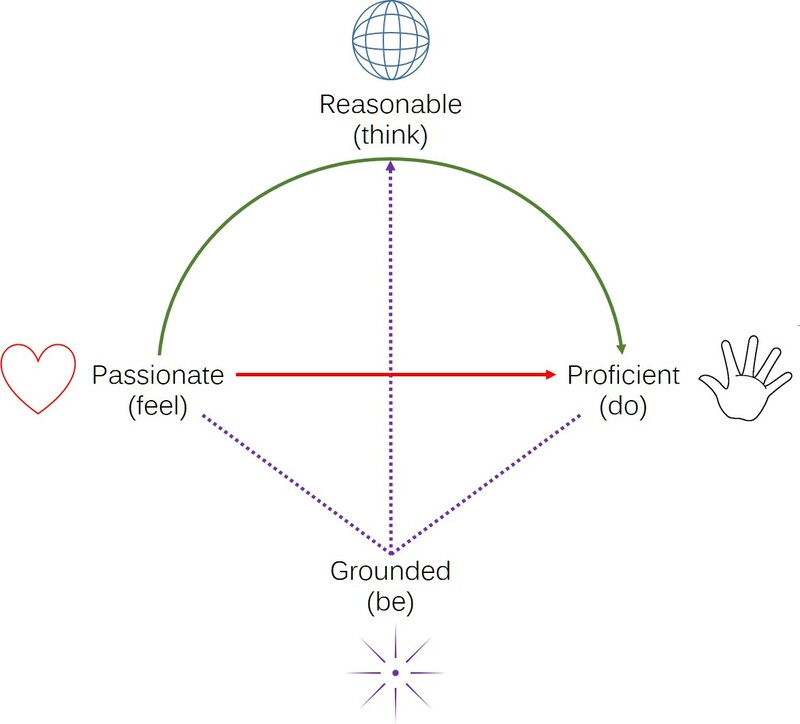 Stepping up a level in my diagram, I have named this motivated quest for security “ambition,” with its dual (ambi-) drives of craving for what we desperately need and fretting over not finding it, not getting enough of it, or losing it if we should ever manage to grasp an edge. This exhausting cycle of craving and fear is what in Buddhism is called samsara, the Wheel of Suffering. Ambition keeps us trapped in the Wheel for a reason that amounts to a serious bit of wisdom: We will never find anything outside ourselves that can entirely resolve our insecurity, which means that the harder we try, the deeper into captivity we put ourselves. This is where conviction comes in. Earlier I said that a thought or story in the mind won’t become an experience until we agree with it and accept it as truth. But a stronger process plays upward from below, in the body and its nervous system. If we feel insecure, we will be motivated by ambition to find whatever will relieve our insecurity, either by latching onto some pacifier (“Calm me! Comfort me! Complete me!”) or closing our mind down around a black-and-white judgment that resolves the ambiguity and gives us a sense of safe distance and control. A conviction is therefore a reductionist simplification of something that is inherently ambiguous and complex – and what’s more ambiguous and complex than reality? We should by now have some appreciation for a conviction’s therapeutic value in resolving ambiguity, simplifying complexity, and providing some measure of security in a reality which is surely provident but not all that secure. If its therapeutic benefit were all that mattered, we would be wise to leave everyone alone with their convictions. But there is one more piece to the picture, which is how a conviction screens out reality and serves as a prejudgment (or prejudice) against anything that doesn’t quite fit its box. By buffering our exposure to what might otherwise confuse, challenge, upset, or harm us, we can feel secure inside our box, hiding from reality. Once we have filtered out what makes another person uniquely human (just like us), our prejudice will justify any act of dismissal, discrimination, oppression, abuse, or violence – all in the name of our truth. 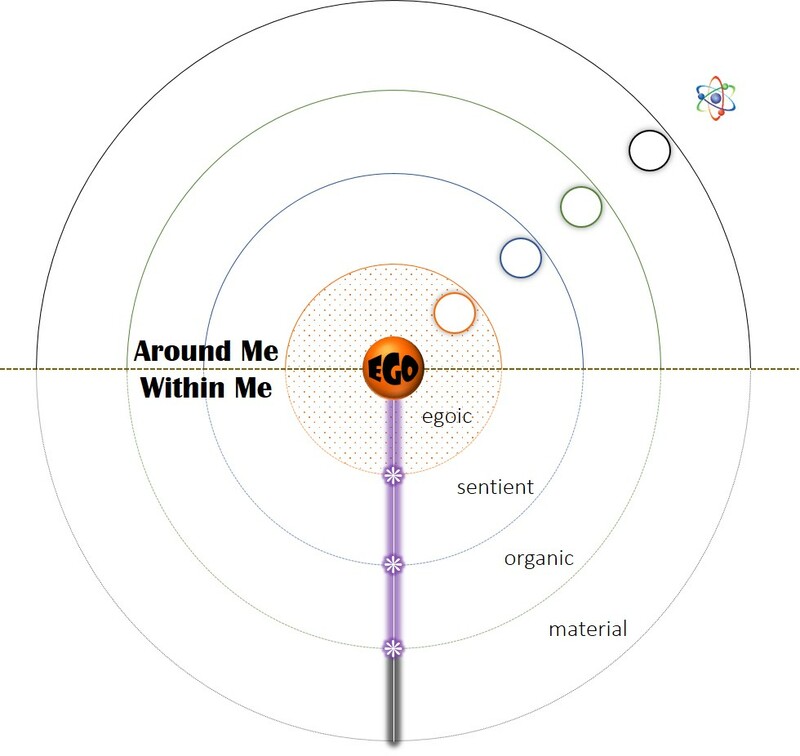 In my last post, I introduced the idea of body, ego, and soul as “standpoints in reality” – not as pieces of a human being, but rather as different mental locations where we can take a perspective on things. Body is organismic and biological, providing us a standpoint in the physical realm. Ego is tribal and personal, giving us a standpoint in the social realm. And soul is psychological (from the Greek psyche, soul) and spiritual, offering us a place in the presence of mystery, in the present mystery of reality. Instead of breaking these aspects of the self into separate and warring opposites – ego against body, body versus soul – seeing them as distinct access points in our experience of reality can help us transcend the arguments over which one is “the real self” and contemplate instead human being in its wholeness. Rather than identifying ego with the soul, and then dissociating both from the body so “I” can elude the finality of death and live forever, we can appreciate how each contributes to the marvel of what it is to be human. I reflected on how ego develops out of a simple identification with the internal state of the body. “I am happy” or “I am sad” are among the first ways a young child is taught how to declare him- or herself to the world. This affect (pronounced with the accent on the ‘a’) is where a child’s experience of the world is registered: “The dark closet makes me afraid”; “You are making me angry.” Behavior is then the output channel of this affect, in the way it motivates the youngster to run and hide, or push and pout. Many people get stuck at this level of development. They remain in the I-am-angry-and-can’t-help-but-push-you-down mode of life. A significant number of them seek out professional help because they are hostages to affect and can’t stop doing things that are counterproductive to happiness. A truly helpful counselor will teach the client how to reflect on these powerful affect states. Instead of simply acting out the affect in behavior and only making things worse, the client can learn how to separate identity (ego) from emotion (affect→behavior) and use this freedom to choose more desirable outcomes. The “liberated ego” can thus become a springboard into still higher experiences, which the wisdom traditions around the planet have named Love, Communion, Being, and Bliss (among others). It’s important to understand that these are not merely synonyms for “happiness.” The ego wants to be happy, but the soul seeks after something much higher than personal happiness. To get there, ego (I, me, mine) must be transcended, gone beyond. If it stays in charge, the personal self (ego) will be in the way. As I suggested last time, a shift from the standpoint of ego to that of soul opens the self up to a much greater experience. 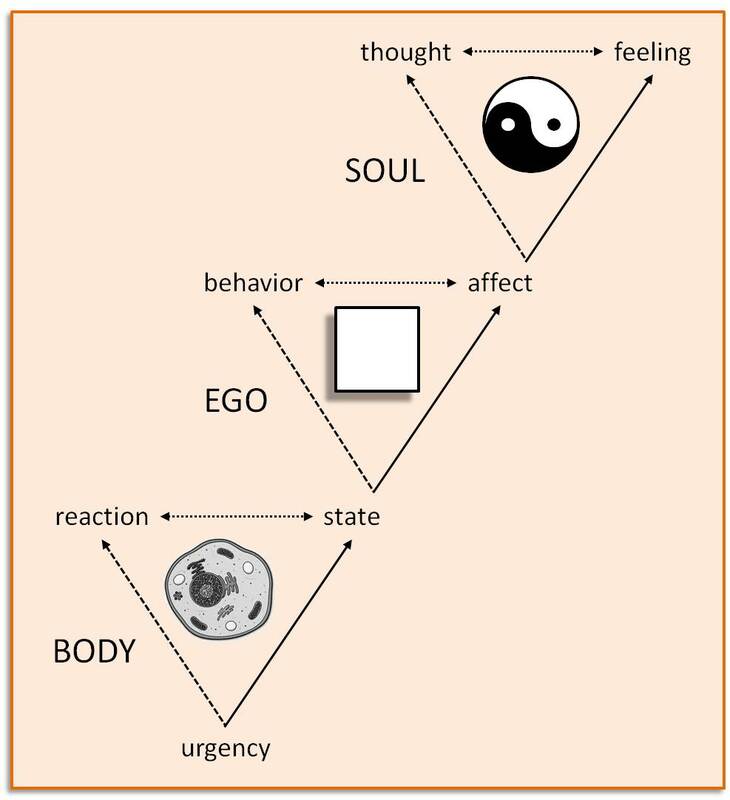 Engagement with reality at this higher level is not impersonal (as it is for the body) or personal (as it is for the ego), but transpersonal – again, beyond the personal. This is where affect differentiates into feeling and thought. These are the Yin and Yang, respectively, of the soul’s experience. Their “tension” is not combative but creative, like the tension in a string that produces a musical tone. The wisdom traditions refer to these higher faculties of the soul as “heart” and “mind.” Once liberated from the urgencies of the body and the self-interest of the ego, heart and mind are free to contemplate the present mystery of reality. If I were to describe in one word what each of these faculties of soul contributes to the experience I would say that mind/thought represents reality and heart/feeling participates in reality. Let’s see how this plays out. Insofar as mind is dependent on language to name and describe something (the present mystery) that is ineffable, it has offered up these two metaphors for contemplation. Ground is the generative source and deep support that stands underneath all things. Existence – which literally means “to stand out” – properly refers to everything above the ground, so to speak. The ground itself, then, does not exist in this sense. It is pure being, the internal essence of all things, the be to their ing, the creative power of being-itself. No words can describe it, because language can only qualify what exists and the ground is beneath all qualities. Even the name “ground” must finally be released. In contemplating the mystery as the ground of being, the mystics advise us to stop talking. As a representation in thought of the real presence of mystery, ground inspires the heart to a certain exquisite kind of feeling. This is not crude emotion, where affect drives behavior. Rather, this feeling registers our participation in the mystery that cannot be named but only surrendered to in complete self-abandonment. In letting go of qualities and attachments, the self can sink into the “solvent” of being itself. The feeling of participation gives way to the bliss of unqualified union or oneness. Another worldwide representation of reality is universe. This is not to be confused with a term such as “cosmos,” which is a more-or-less scientific name for the vast order of things (cosmos is Greek for order) that can be analyzed into galaxies, stars, planets, moons, minerals, elements, atoms and quarks. Universe is another metaphor, like ground, and not merely a designation of order. As metaphor, universe is a concept of pure thought, a representation by the mind of the mystery all around us. Literally universe means “turned into one,” which is precisely what this concept does for the soul. It provides a way of contemplating the comprehensive unity of all things – inclusive, interdependent, balanced, turning as one. The soul seeks after wholeness, and the representation of reality as universe offers a simple – though admittedly infinitely complex – image for contemplation. Notice how “ground” and “universe” stand at opposite ends of a vertical continuum. Ground is in and down; universe is out and up. Ground is beneath us, whereas universe is all around us. Ground is unqualified being, while universe is qualified to an infinite degree. Finally, ground cannot be said to exist, but the universe is the totality of existence. Contemplating reality in the representation of universe inspires a different sort of experience for the heart. Participation here does not lead to a feeling of dissolving into pure being or oneness, but rather of being elevated into an expansive community. Whereas the former experience is that of sinking into no-thing, the latter is realizing your connection to everything. In thought, then, the soul represents the present mystery of reality as ground and universe, as the underlying oneness and overarching all-ness of existence. Depending on which representation is the focus of contemplation, the feeling of participation will be distinct and complementary. This interplay of feeling and thought, of heart and mind, of Yin and Yang, is how the soul touches the mystery and finds salvation.